Because today's evangelical world believes that the church is experiencing the Messianic kingdom, we began a study chronicling what the Bible teaches about the kingdom. In this series, the biblical teaching on the kingdom has been surveyed from Genesis to Revelation. This earthly kingdom is anticipated in the office of Theocratic Administrator that was lost in Eden, in the biblical covenants, in the predictions of the Old Testament prophets, and in the earthly theocracy governing Israel from the time of Moses to Zedekiah. This theocratic arrangement terminated with the initiation of the "Times of the Gentiles" when the nation had no king reigning on David's Throne as Judah was trampled by various Gentile powers. Against that backdrop entered Jesus Christ, the rightful Heir to David's Throne. Had first-century Israel enthroned Christ, the earthly kingdom would have become a reality. Despite this unprecedented opportunity, Israel rejected the kingdom offer leading to the kingdom's postponement. We further noted that those closest to the biblical text, the early church fathers, also held to premillennialism or the reality of the coming, earthly kingdom of Christ. We also observed that the problem with using New Testament verses in an attempt to argue that the Messianic kingdom now exists in spiritual form is to interpret the New Testament in a manner that contradicts the Old Testament. In addition, we explained that the expression "Repent, for the kingdom of heaven is at hand" merely communicates that the Old Testament expectation of an earthly kingdom had drawn near in the person of Christ. Had the nation enthroned Christ (Deut. 17:15), what the Old Testament predicted concerning an earthly kingdom would have become a reality not only for Israel but also for the entire world. As long as Christ was present amongst first-century Israel offering them the kingdom, it was in an imminent state of nearness. This reality is an entirely different matter from saying that the kingdom was present or had arrived. Our Father who is in heaven, Hallowed be Your name. Your kingdom come. Your will be done, On earth as it is in heaven. Give us this day our daily bread. And forgive us our debts, as we also have forgiven our debtors. And do not lead us into temptation, but deliver us from evil (NASB). This prayer is more appropriately entitled "the Disciples' Prayer" since Christ was here teaching His disciples how to pray. 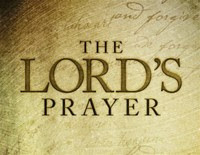 The area of Scripture more appropriately entitled the "Lord's Prayer" is found in Christ's own high priestly prayer of John 17. The "Disciples' Prayer" is often misconstrued and misunderstood in modern evangelicalism. Many seek to organize it according to the pneumonic device "A-C-T-S." "A" stands for "adoration" as in adoration of God. "C" stands for "confession" as in personal confession of sins. "T" stands for "thanksgiving" as in thanking God for His work and provision in our lives. "S" stands for "supplication" as in asking God to supply our needs. "But when he sees his children, the work of My hands, in his midst, They will sanctify My name; Indeed, they will sanctify the Holy One of Jacob And will stand in awe of the God of Israel" (italics added). "'I will vindicate the holiness of My great name which has been profaned among the nations, which you have profaned in their midst. Then the nations will know that I am the Lord,' declares the Lord God, 'when I prove Myself holy among you in their sight'" (italics added). By instructing His disciples to pray for a coming age in which the Father's name would be revered, He was instructing them to pray for the kingdom to come. Third, Matthew 6:10b says, "Your will be done, On earth as it is in heaven." God's rule in heaven goes unchallenged. There, His decrees are never second-guessed. Here, Christ instructs His disciples to pray that the unchallenged rule that the Father enjoys in heaven would one day become an earthly reality. In other words, Matthew 6:10b "...is an appeal for God's sovereignty to be absolutely manifested on earth." Such a request for the establishment of the sovereignty of God on earth is in essence a prayer for the earthly materializing of God's kingdom. In sum, the first three clauses found in the "Disciples' Prayer" (the requests for God's name to be revered, the kingdom to come, and the sovereign will of God to be done on the earth) are in reality requests for the yet future kingdom. Kenneth L. Gentry, He Shall Have Dominion (Tyler: TX: ICE, 1997), 223-26. Henry Allen Ironside, Expository Notes on the Gospel of Matthew (New York: Loizeaux, 1948), 63. Stanley D. Toussaint, Behold the King: A Study of Matthew (Grand Rapids, Kregel, 2005), 107-112. George N. H. Peters, The Theocratic Kingdom , (New York: Funk & Wagnalls, 1884; reprint, Grand Rapids: Kregel, 1952), 1:195. Ed Glasscock, Matthew , Moody Gospel Commentary (Chicago: Moody, 1997), 147.